This article made its way to me a little late, but I wanted to be sure the word got out. How will you combine the elements to make something “material”? We hope you are working on your 2018 “Earth – Wind – Fire – Water” Challenge Quilt! 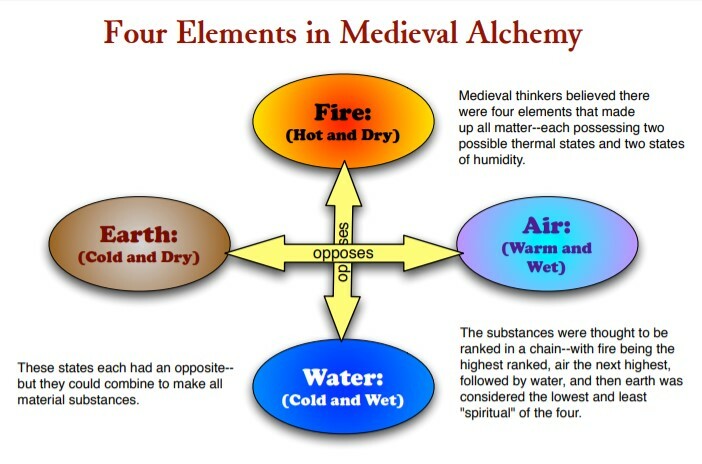 You can feature one or more of these four medieval elements in your quilt. This is a reminder that the quilt should be turned in on Thursday, June 14, 2018 (at the OCQG meeting). We also forgot to mention that in addition to the other requirements (see OCQG website) a hanging sleeve would also be needed. See the poster display at the next few Guild meetings to get an info and sign up sheet. Or simply drop an email to Becky Mershon bmershon@peak.org or Judy McCoy jmccoy@peak.org. Meeting time and reminders are always posted on the web home page. The latest meeting minutes are found on the web under “Records/Forms”. Block of the Month news will be under Projects as well as the Veterans Project. And don’t forget to check the Calendar (On the Events tab) for many events relating to the guild and the wider community. It was wonderful to have a Newsletter with everything in one place, but sharing information via the web allows several people to edit and be responsible for information pertaining to their committee. Explore and let me know if information is incorrect (Lighthouse Quilters meeting time and place was corrected – thanks to Shirley Gilmore’s email to me) or if there is something you would like included. The web is a work in progress, but with your help it can be a powerful and timely communication tool.